Image caption Treasury secretary Jack Lew says that he will rely on accounting measures to pay the bills for a few weeks. It's almost hard to believe, but it's happening again. 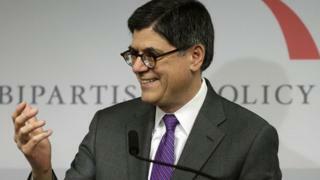 US Treasury Secretary Jack Lew warns that the world's largest economy may default by the end of the month if the debt limit is not raised. The $16.7tn debt ceiling will be reinstated on Friday after being suspended since October as part of a budget deal that re-opened the federal government after a shutdown. Lew says that he will rely on accounting measures to pay the bills for a few weeks. This is a replay from last year. Recall then, as now, that there's been (and still is) a lot of uncertainty as to when the US Treasury will exhaust those "extraordinary measures". The US government can't borrow once it hits the debt ceiling but it receives around $7bn in revenues every day, which is how the government managed for a while. The Congressional Budget Office, considered to be bipartisan, estimated last November that the Treasury may not be able to fully pay its bills starting in March but may last longer depending on tax receipts. I didn't think that the knowledge that I accumulated writing on Greece would come in handy for the US. In any case, here's a primer on default. What if the US government fails to pay money to its creditors when it is due? There's general agreement that, hard though it seems to not pay contractors, like defence companies, not paying hospital bills, or even not paying individuals their pensions, would not be the default everyone is so worried about. It would have consequences - personal and economic, of course. What's a technical default, and would it matter? A technical default is when an interest payment on debt is missed. Whether this is no worse than a missed credit card payment is up to markets. When this happened before in 1979, US borrowing costs shot up for several years thereafter. That would mean higher borrowing costs for households and firms. But, there wasn't a panicked sell-off of US debt or chaos in the markets. Of course, the world is different now and the US is the benchmark for a vast global financial market, so much will depend on investor reaction. Would it cause the US credit rating to be downgraded? If the US misses an interest payment, the major ratings companies (S&P, Fitch, Moody's) may downgrade America from AAA (or AA+ as it were for S&P) into what's called 'selective default' or 'SD' until the payment is made. It's very unlikely to be a permanent downgrade into default or the slightly higher junk territory if it is fixed fairly rapidly. A credit rating downgrade may happen anyway, as Fitch said last time that it wanted to examine what's agreed and if brinksmanship over the debt ceiling could happen again. Bear in mind, though, that the rating companies themselves have been under criticism since the sub-prime debacle. So, for some investors, the ratings don't hold as much weight, especially since there are many sources of information on the US economy. Why are people worried about a credit event? A credit event is an important legal term. This is what would cause significant repercussions, so please bear with me. A credit event is a default that triggers payout on default insurance. This is roughly what a CDS (credit default swap) is, a contract that pays if the insured government or company defaults. There's about $3.63bn of such contracts around. A group based in Connecticut known as ISDA (International Swaps and Derivatives Association) is the arbiter of whether a credit event has occurred and roughly speaking "pays out" on the CDS contracts. I say "roughly" because it's actually paid out via auction. For ISDA, a downgrade into default by a rating agency isn't a trigger for a credit event. The ISDA definition includes 'failure to pay', which can be construed to include a technical default. But, it only refers to a failure to pay creditors (honour debt obligations) and not on payments in general. Recall that California, during the financial crisis, issued IOUs to pay its bills in order to avoid default. There is normally a grace period of three business days. Unlike in October when a relatively small amount of interest payments of $6bn were due on government debt, the payments due are much higher in February: $35bn is due on 15 February and another $6 billion on 28 February. So, 18 February and 5 March are key dates. The interest payments are much lower in March ($6.5bn) and April ($7.7bn, which are also to be paid on the 15th and the last day of the month. By the way, the reason that there is a grace period is to "avoid technical triggers that could be caused by natural disasters, human error or catastrophic events." Political gridlock probably qualifies as human error. What happens if the US really does default? Frankly, no one really knows. The US is so integral to global markets that the prospect of it being in default even briefly is difficult to contemplate. It would make all other defaults (Lehman, Greece) pale in comparison.